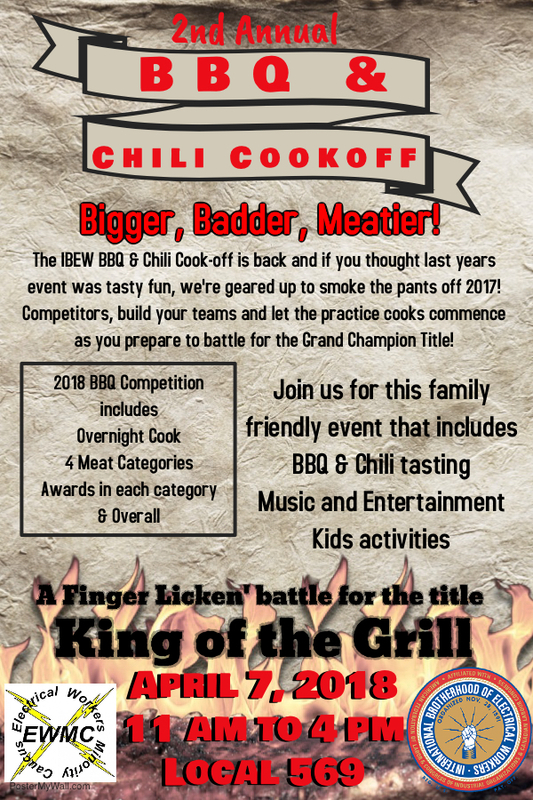 Mark your calendar for the 2nd Annual SoCal IBEW BBQ and Chili Cook-Off - organized by EWMC San Diego, IBEW 569, and IBEW 465! Click here to RSVP and/or sign up to compete! Last year, over 500 attendees tasted offerings of tri-tip, ribs, chili, chicken, and potato salad. Kids were entertained with face painting, a clown, movies, and popcorn. The 2nd Annual SoCal IBEW BBQ and Chili Cook-Off will be bigger and better and include an invite to all IBEW Local Unions in Southern California. Mark your calendar now for April 7, 2018! Click here to see more pictures on Facebook from last year! Click here to see more pictures on Flickr from last year!